Two ordinary objects turned a pair of brothers into superheroes. Now they're banding together with their neighbors to take down the evil Trench once and for all in the final volume of this graphic novel trilogy. Tuck and Hudson have figured out how to wield the superpowers they got when their mom bought them an ordinary-looking pair of scarves and an umbrella at a yard sale. But Trench, their supervillain archnemesis, is only getting more powerful. Slowly, the brothers have discovered the others in their town who have superpowered objects from that same yard sale. Now Tuck and Hudson, along with their friend Elvira and their squirrel sidekick, Steen, are leading a band of heroes in the fight against Trench. 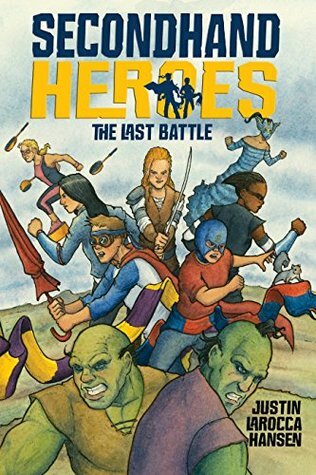 This final volume of the graphic novel adventure series features the heroes' last stand, with plenty of twists and turns along the way. Thank you Justin for visiting the blog today. In Secondhand Heroes, two brothers become superheroes using two scarves and an umbrella their mom bought at a yard sale. Why these particular items? And how did the idea of becoming a superhero from secondhand items come to you? My family has always had a healthy collection of “junk” in our basement. As a kid I would spend hours going through some of that junk and discovering items from my parents’ and grandparents’ past. I think there is something magical about that. Each item has an unknown history and mystery to it. It was an easy leap for me as a child and an adult that something in those piles of junk could contain actual magic. I picked an umbrella for a few reasons. It’s such a fun tool. I mean…it starts as a sword and then can open into a shield! Well that’s how I thought about it when I was young. With its curved handle it always gave me the impression that it could pull you and you needed that curved handle to hang on for dear life. Which of course can happen in the right storm or if the umbrella could actually fly. For the scarves I just love the action of swinging and gliding and scarves that can stretch and take any shape fit that model perfectly. Also I talk with my hands a lot and sometimes a scarf can become an extension of that. In your author bio it says that much of your work is inspired by your own childhood adventures. Can you share some of those adventures that inspired this particular series? Yeah and this often happens without me fully realizing it. A lot of the characters are based on real people. The brothers are heavily influenced by my brother and myself, the villain, Mr. Motstander aka Trench, is based on my 7th grade English teacher and there are quite a few moments that mirror real life moments. For example my brother and I were walking down a beach in Cape Cod very late at night and we came upon a SHARK. It was beached, flopping on the sand and the surf was way too rough for it to wiggle its way back into the ocean. So we decided, let’s save this shark. We picked it up and waded past where the waves were breaking. We whispered good thoughts to the shark and gently tossed it into the water. Than we ran out of there as fast as possible as we did not want it to turn around and give us a nibble. Now I will tell you saving a shark’s life really boosts the ego of a teenage human. We felt like heroes! We strolled back down the beach and my brother found a beat up old umbrella. He ran to the top of the sand dune and, intoxicated by his newfound hero status, he leapt off the dune, opening the umbrella as he fell. I suppose he thought he would float to the ground? Of course he plummeted to the earth, hit the sand and twisted his ankle. But for a moment I pictured him skyrocketing into the air barely hanging onto that umbrella. Twelve years later that umbrella moment found its way into Secondhand Heroes. I didn’t do it consciously, I had forgotten about that moment until well after I wrote about it but the seed was certainly planted. The title of your latest Secondhand Heroes book is called The Last Battle. Does that mean this series will only be a trilogy? Or is there more in the works? Yes, for now it will just be a trilogy. There are definitely more adventures for these characters, I have sketches and some moments written out but for now this will be it. I work in ink and watercolor so a project like this is incredibly time consuming. I have a couple picture books that I’m really excited to work on now so maybe when I get those out I might revisit the Secondhand Heroes team. One of my favorite parts of series is the squirrel sidekick, Steen. What made you decide on a squirrel for a sidekick? Me too! Well for one I love squirrels. I think I may have been one in a previous life. The way they leap from tree to tree is just so beautiful to me. But also real life Steen bumped into me once. I was walking to school one day when I felt this furry thump against my leg. I looked down and around and saw nothing. I looked further into the woods and there sitting on a stone wall was a squirrel. Apparently he was attempting to shoot across the street and my leg got in the way. We had this moment where we just stared at a each other for a bit, both a little freaked out. I never forgot that little guy and he eventually made his way into my books. Named after the great, great Bruce Springsteen by the way. Since this is a food, books, and travel blog, my last question to authors is always the same: what is your favorite food, book, and place you've ever traveled? My favorite place in the world is the island of Nantucket. There’s some real magic and history in that place. Sometimes the fog rolls in on a summer day and it will feel like you have the entire beach to yourself because the fog is so thick you can’t see twenty feet in front of you. It’s eerie and beautiful and amazing. The island of Scraggy Neck in Secondhand Heroes is based on Nantucket. Favorite food is a tough one! Mom’s spaghetti and meatballs? A good roast beef sandwich? I’m gonna have to go with a clam baked lobster. That’s when you burn wood and rocks for hours, then rake out the rocks and coals so they’re even, throw seaweed on top of the rocks and coals, put the lobsters on the seaweed, cover with a tarp and then they’re steamed from the seaweed. So delicious. Favorite book is also very hard but I’ll have to go with Wizard and Glass by Stephen King. It’s the 4th book in his Dark Tower series and is such a great story of young love, tragedy and young people realizing the scope of their power and abilities.